Do you enjoy arts and crafts? Do you friends and family often find you busy crafting? Well this is possibly the blog for you, crammed full of arts and craft ideas for the garden, home and family. You'll always be busy crafting now! When you are thinking about herb garden design, but realise that your yard will only accommodate a very small area for herbs, and yet you are keen to grow a wide variety to complete your herb garden delights, there is a way to maximise your growing space in a small plot. That is by designing a herb spiral. A herb spiral is simply a way to introduce herbs into your kitchen garden in a small space, with a spiral of bricks or large stones or any ornamental building material which encloses a heap of soil up to two metres wide, and about a metre or so high. Basically the idea behind this concept is to provide space for as many different herbs as possible in a restricted area. The shape of the spiral and the height differences that you create provides different environments which you could not obtain in a level small space. Your finished spiral does not have to form a circle but it is neater and easier to work in than an oval shape. After all the idea is that you can easily reach to the centre of the completed spiral for planting, pruning and harvesting. Where you actually site your spiral will be a matter of your own choice, but if you intend to concentrate on culinary herbs then as close as possible to your kitchen is the ideal. Just remember that you will need a bright sunny position. 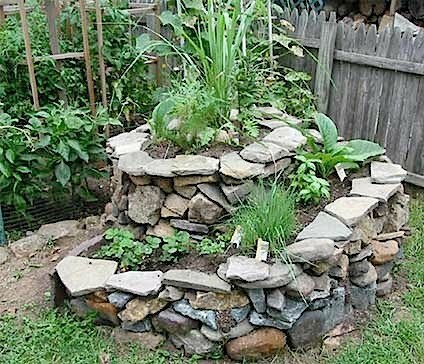 The materials that you are needing, besides the wall brick or stones, will be small pebbles, pea shingle, course sand, a non peat compost as your growing medium, some fairly thick cardboard or a supply of newspaper, some composted organic material and some ordinary garden soil. First of all you need to practise drawing a spiral to scale of 1mm= 1cm. Put four dots as points of a diamond 200mm apart on your paper. Inside each dot place another dot 50mm away and then one more dot in the centre, which will of course be a further 50mm inside all the second layer of dots. Now starting at the top dot, draw your spiral by joining the dots keeping your line 50mm apart as you progress round and round. Having practised this on paper you should have no difficulty doing the real outline on the garden plot using cm instead of mm. Line the outer ring of the spiral with the cardboard or newspapers to stop weeds coming up. Lay out the outer ring to the fourth dot with your building material (two layers if using house bricks) but gradually raising the level to 50cm and infill to quarter height with garden soil. On top of that goes a 10cm layer of the composted organic material topped off with a layer of pebbles, a layer of pea shingle and a layer of course sand. Leaving about 15cm unfilled at the top. While filling in, continue to place the inner ring of building material as far as the eighth dot gradually raising the level until you are about a metre high. Finally complete the spiral by continuing level, build round to the centre dot and finish infilling as described. You should now have a gently rising spiral of sand which needs to be topped with about 15cm of your growing medium. As a design refinement you could make a small pond at the outer end of the spiral. Just dig a hole and line it with a suitable waterproof material, creating a swamp area at the outer edges. If you have electric power available you could install a pump in a suitable pond and have a misting spray coming out of the middle of your spiral. You will naturally have to lay the necessary piping before you start laying your spiral, and of course keep the pond topped up with water; but you did not need me to remind you of that. My name is John and I've been interested in growing and using herbs for longer than I care to think about. Having carried out a great deal of research on the subject I've now compiled a huge amount of knowledge which I would like to share. To see more great information about herb garden design, please visit my website where there is so much more information generally about herb gardening. Also you will find there are details of a free herb gardening mini-course that I have prepared for you, at: http://www.herbgardendelights.com. I must apologise to anyone who wanted to access my website early in January because it was out of action due to a malfunction. Everything is now working properly. If you were to Google "John Beaver" you will find there are hundreds of us out there, but I am the one on the first page listed for EzineArticles. So if you have missed any previous article you can find them all listed there.